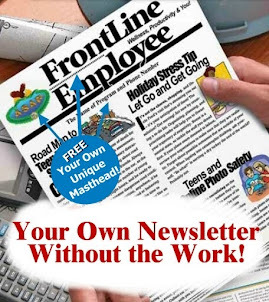 Employee Assistance Programs Blog: America's First and #1 EAP Blog*: Can Real EAPs Intervene and Help Prevent Financial Disasters by Helping Disgruntled Employees Stay Away from the Social Media Web Sites? Can Real EAPs Intervene and Help Prevent Financial Disasters by Helping Disgruntled Employees Stay Away from the Social Media Web Sites? EAPs frequently deal with disgruntled employees. It's a significant part of the job, but the benefit of this activity to the financial world doesn't get a lot of play in the EAP literature. For many of us, well, it simply sounds too self-serving. This is a big problem for many people in the EAP field — viewpoint. Disgruntled employees are often seen as helpless malcontents, troubled, and expendable. Typically, stories in the EAP literature focus too much on how to help these employees be happy, healthy, and productive, while they omit the real story behind the story. That story is how this helpful activity keeps employers' financial butts out of the sling. EAPs don't get the credit because we aren’t talking about it, and it is my argument that we should care a lot more about this side of the equation. Why? There is a new twist in the 21st century that is leveling the playing field and giving an upper hand to disgruntled employees. It is making the importance of having an effective, proactive, well-in-cultured EAP critical and worth every cent it costs. That new twist is the social media, especially Web 2.0 sites like YouTube.com. These are free, monstrous, broadcast media outlets that take no prisoners. An EAP that is visible, known, trusted, and has a real face with it can attract employees who may turn to it with the goal of processing their frustrations, complaints about ethics, anger with supervisors, or tales of abuse and harassment. 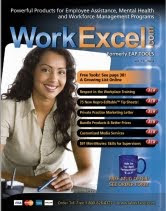 Effective EAPs work with two hats in these situations empathizing with the employee, and protecting the company financially by helping the employee get their needs met in effective and appropriate ways. Absent this level of easily accessible and visibly marketed support for employees, companies place themselves at financial risk. This is especially true if they try to get an EAP on the cheap. For most, this is a direct result of naivety or advice from misguided benefits consulting firms. As I write this column, Bank of America has 300,000,000 shares of stock trading (Dec. 8th). But a YouTube.com video posted by a disgruntled employee only a week ago has received over 146,000 views and counting (Woops! Update - now over 220,000 on 1-10-10. See what I'm saying?). This growth is the result of word-of-mouth advertising about this video. This is called "viral marketing". It is a powerful force. To wit, mainstream media, without any qualification or fact-checking, has picked up on the video and is using it for its own economic purposes. I have provided the links below. Not surprisingly, Bank of America's stock price has nose-dived in the same week. It has lost millions. Is Bank of America's stock price drop the direct result of this video? No one can say for sure. But it is safe to say that it is not helping. And it is more likely that people are looking at this video than press releases about BAC's financial future. Do you see an argument for having an effective, humanly visible, and appropriately funded employee assistance program that can act as a stop-gap to helping an organization by dealing with and sincerely helping troubled or disgruntled employees? Can you see the value in making an EAP a benefit to employees and a loss-prevention, management tool for business organizations? The latter is under-appreciated and it is continually ignored. This is a direct result of a "reformulated" model of EAPs that has been promoted in the health benefits and managed care literature, and has been accelerated by being unchallenged in an organized way. 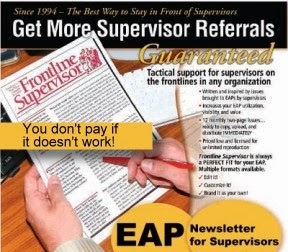 Whether it is supervisor referral of an employee who may soon lose their job over poor job performance or an EAP being a program of attraction where employees head for coaching, wisdom, and direction, EAPs have unsung potential to be more vital to corporate America's financial security than we are hear about or see. If EAPs don't toot their own horn to more viable customers, they risk being kicked out of the symphony. It is my belief that once the property casualty insurance industry (the real stakeholders) make this connection, that is seeing vibrant EAPs as loss prevention mechanisms, the EAP field will experience explosive growth in a new direction that will result in less violence in the workplace, few disasters like the one below, and of course, more helped employees. To see the video, go to YouTube.com and Search “Why Bank America Fired Me”.